Introducing Courses with IELTS 4.5, 5.0,5.5, 6.0 Band. With-out IETLS with Good academics record. Follow simple 4 step process. 1) Send us filled application form of college with credit card details for CAD $150 - application fee of college. 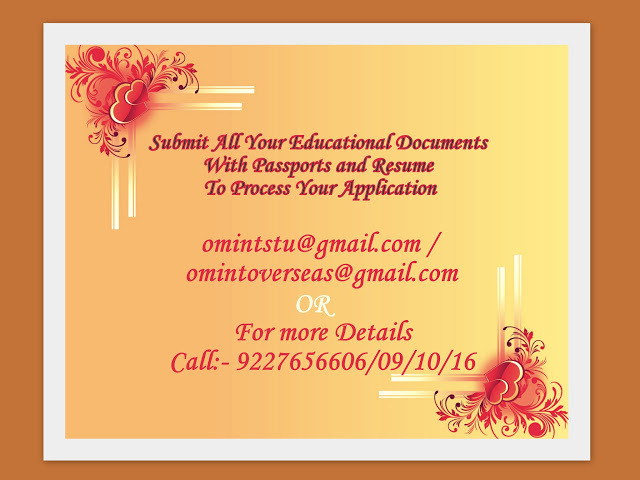 2) Send us passport copy + academic docs + IELTS/TOEFL Result (If applicable) in one PDF. You will received conditional acceptance letter within maximum 5 days. 1) Send us demand draft of CAD $ 2000. You will receive Letter of Acceptance within 5 working days + Accommodation letter. 1) We can either apply for visa by paper application or E-visa. 3) GIC is not mandatory but we prefer for high visa success rate. In case of no GIC we request to show funds around 11-15 lacs depending on course and total fees. You can even show Loan against Fixed Deposit. 4) Pay visa fee- approx Rs. 9000. 6) Submit all other docs required as par rules. Normally visa decision is taken in 15- 30 days time. 2) Pay our service charges of Rs. XXXXX. Student will travel to Canada- we will help for Airport pick up and accommodation. 1) Upon receivable of Refusal letter (will be verified by Institute), we will send DD of $2000 return to you within 48 hours. 1) HND BUSINESS MANAGEMENT – see page 10 for full details. Labels: CANADA STUDENT VISA, STUDY IN CANADA, Study in Canada Diploma/Bachelor's degree/Post-Graduate programs.